Wonderful, wonderful quilt! But you need to explore the wide, wide world of quilting. Yes, I agree, there are many applique sweatshirted quilters as you describe out there (actually, many in my city, too, whom I've described similarly) but legions of us are embracing fresh, new interpretations. How could anyone dislike your gorgeous quilt? I made my first quilt when I was 22, nearly 8 years ago. I live in a (big) country town, which had a very strong crafting community. Most of my friends are crafters, and whilst we certainly do have the appliqued sweatshirt girls (who aren't all over 50, or even 40, FWIW), we also have many older/elderly crafters who love seeing us young 'uns coming up through the ranks, and tell us how they love seeing the new ways we do things. For quite a few years I regularly attended my local quilting guild, always the youngest by far, and often looked up to the older 'girls' for being more daring with projects than perhaps I would have been!! This isn't a post in defence of the rigid set, don't get me wrong, I've just been very fortunate not to have come across too many crafters who can't cope with thinking outside the square. And I wonder if it's the difference in geographical location, too - here in the country you do tend to know a LOT of people you see down the street, in the shop, and whilst that has its' drawback, for the most part it makes for a very friendly community. I for one absolutely adore Max's quilt, and wished my more traditional self was more inclined to be so bold and adventurous. Make from your heart, and buggar what anyone else thinks - they're probably just jealous!!! Alison, your quilts have inspired me to start sewing. I am not a big fan of traditional patchwork quilts. I never before wanted to make a quilt. i want to make one now. A modern one, kinda like yours, but not exactly :) cos it will be mine! Thanks for the inspiration. Keep quilting - and don't pay attention to the quilting snobs out there! Everyone has to start somewhere and they should remember where they started. 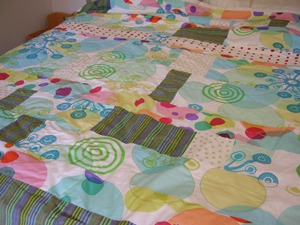 I like your colour choices and the quilting is GREAT! Don't sell yourself short. You're quilts are great! And it's okay to not know what you are doing. That's how new and innovative techniques are created. It's unfortunate to have met with the quilting police. Under their strick rules even the Gee's Bend quilts wouldn't be quilts. I know nothing about quilting so wouldn't be aware if you were doing anything "wrong" but I love your quilt! The colours are gorgeous and I love the circle-ness (I always think of quilts as very squarey) and the hand stitching is such a nice touch, well done! when i FINALLY do a quilt i hope i follow your devil may care attitude because i certainly don't want to be one of those boring rule following quilters. it is quite beautiful, well done! That quilt is one superfab piece of work. Lucky guy who gets to jump on that. I read your posting with a big smile on my face because I *so* share your (perhaps narrow) view of the quilting world. I have *so* been disappointed when approaching quilting shops in Norway earlier, only to find ugly(!) designs in "fun" fabrics. It is only this last year of reading sewing blogs and discovering you cool quilters out there that has made me even consider doing some quilting myself. Now I'm even actually able to see possibilities among the fabric rolls on the shelves. I haven't laughed or thought, finally, a kindered spirit, like that for a long time. I love your quilt. It is bright and gorgeous and Max will love it. And yes, those ladies, or the "quilt police" as I refer to them, have such a way of making me feel that my quilts are somehow inferior. They are slightly puckered, the squares are a bit off centre and don't quite line up, I have no "flying geese" in my border with some bad brown and maroon floral fabric and I have used the kind of fabric that they wouldn't touch with a barge pole. And you are so right, they do wear appliqued windcheaters. I hear you sister, I hear you. And I see Amy Butler's new range on her web site. No appliqued windcheaters to fight off there. I'm sure Amy is not their cup of earl grey tea. Technically, I knit "backward". I don't do it right. But I absolutely LOVE my finished pieces! SO to heck with the quilting gods- your quilt is gorgeous and you should be so proud of yourself!! YOur son will treasure it forever. I for one love it! 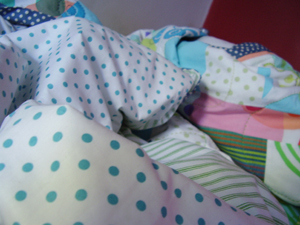 I love traditional quilts and admire the skill involved, but I am much more of a rebel in that area. I think that the wonderful thing about quilting is that there is so much room for creativity - the combination of fabrics, the colors, the quilting designs - that every single person can make their own stamp on the art. 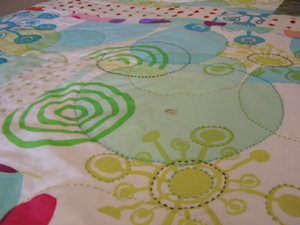 I love your circles, I love the colors, and I love the contrasting quilting thread. This one is very inspiring to me! stunning. and what cracks me up is that the quilting scene is EXACTLY the same here in the US. Ha! Your quilt is gorgeous, Max is going to love it for a very long time. oohhhh.... i LOVE it. you did a fabulous job! Man oh man. What a gift! This is something Max will have forever. And who cares what those ladies thing? Art is subjective and I for one this this is pretty darn cool. i think it is stunning! beautiful work. Max's quilt is absolutely fantastic! When I made my daughters quilt for her first birthday I was thinking about the quilt you were making for Max. 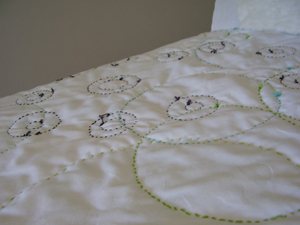 I loved the idea of Max lying in bed tracing the stitching with his fingers. That image really stayed with me - it sums up the true reason for quilting, which by the way has nothing to do with whether the stitches are the perfect length or the colour values are correct. Quilting is about love and need. And most of all, about our need to show our love. Lucky Max to have such a wonderful quilt to snuggle under.